365 days and thousands of photos later— these are 10 photos which I took that I liked the most. 1. I woke up to this sky this past October in Cambridge Bay, Nunavut. I didn’t want to go outside to photograph it, but the colour just got too bright and red. A friend calls it my Martian sky. 2. In August, also in Cambridge Bay, when the sun had set, the sky was lit up on top with a pink colour, then became deeper blue below. I also realized in this photo there’s a lot happening besides the sky: There’s a tanker and a friend walking home. 3. I went driving around to try and catch the super-moon as it rose in September in Cambridge Bay: Here you can see it rising over the airport. 4. A peregrine falcon warmed itself on this September day. That day by Mt. Pelly outside Cambridge Bay we saw many hawks and peregrines all enjoying the mid-20 C temps. 5.But it was not always sunny. On this morning the sunrise looked a bit apocalyptic though the window, with Cambridge Bay’s fuel tank farm in the distance. 6. 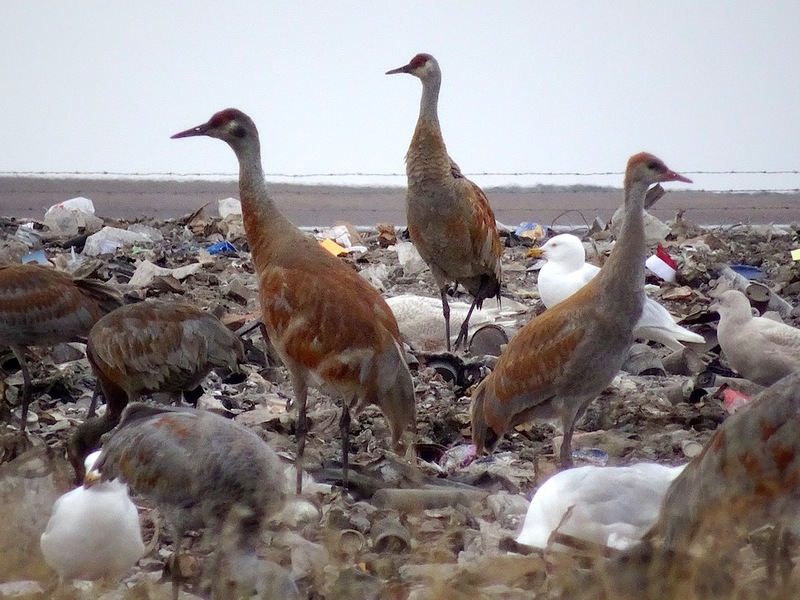 I took a walk up to the dump in Cambridge Bay and found a few dozen sand hill cranes feasting on the trash. 7. Ice grows in bubbles beside a pond in Cambridge Bay, not sure exactly how. 8. I never get tired of watching snow buntings which hung around this year well into October in Cambridge Bay. 9. Wow! On a visit back to Finland, the bright , bold colours of Marimekko designs impress me many years after I worked as a salesclerk in the company’s stores. 10. And here I am with my Finnish sister Kirsti this past summer in Finland, just the best place to be. Let’s all have a great 2017 to come! Onnellista uuttaa vuotaa!